Who is REALLY profiting from your beauty care purchases? I know that is an interesting question, but I guarantee if you read on, it will make sense in just a bit! If any of you know me, you know that I am on a mission to get people to view things a little differently! I have been around the beauty industry long enough to see the major industry shifts that have happened over the years. And if you read my article on diversion, you got a glimpse of just a fraction of what is going on. Let’s start with this: Did you know that the United States Cosmetic Industry is the largest in the world, estimating a total revenue of $54.89 BILLION? And that this industry is projected to grow 3-4% each year over the next 5 years in the United States? Yes, you read that right…BILLION! Part of my mission is to help as many salons and beauty professionals that I can, become more successful. I am passionate about the industry, and it’s time to put professionals hard earned money back in their pockets, and I have many ways that I can help them do just that, including capitalizing on the billion dollar industry cosmetic industry!! So if the above number intrigued you, that’s just a fraction of what I can help with!! It is no secret that influencers are redefining the way that consumers decide what makeup they should buy. I have an entire post devoted to GLOBAL SOCIAL MEDIA STARS REDEFINING THE BEAUTY INDUSTRY. We can thank Instagram for that. There’s no escaping the fact that the millennial generation’s coming of age has had a ripple effect on consumer habits as we once knew them. I’m not saying it’s a bad thing, No industry has been spared, and all businesses had to adjust the way they market to people. Traditional marketing became obsolete once social media invaded single facet of our lives. Millennials were leading the charge with fresh perspectives, ideas, values, and ambitions. 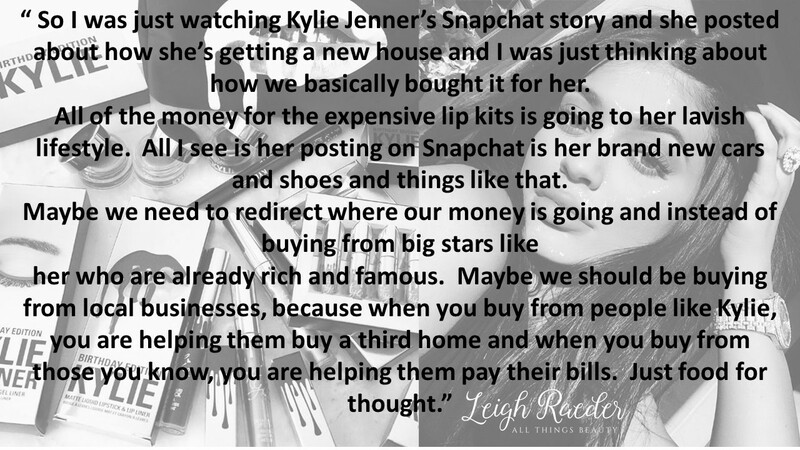 This is what I found: According to Fortune Magazine, Kylie sold $420 million in just 18 months and is on track to reach $1 billion by 2022. Jenner, 20, is currently the youngest celebrity on Forbes’ rankings of the 100 highest paid celebrities in the world. And she is about three and a half years the junior than the next youngest on the list, Justin Bieber. According to Forbes, Jenner earned $41 million in just the last year. Yep, you read that right!! It’s amazing what she’s been able to do in such a short time! Who else are you paying? And that is just one person, but also found interesting was an article about the Top 100 Beauty Brands in Beauty INC Magazine. It listed some of the top personal care companies and their annual revenues. What I want you to pay attention to, is not only the brands these companies own, but the earnings of the top executives. When I look at those figures and see how much the CEOs make, I can’t help but think: How many people could they potentially help if they shared more of that with those that help build the brand and retail the products? As I mentioned earlier in my post, the beauty industry has been evolving and right now is having one of the biggest shifts that it has ever seen. If pros position themselves right and evolve there are a lot of things that can be done to keep the revenue using high quality EXCLUSIVE professional products. So why wouldn’t you? Did you miss my Facebook Live broadcast? You can catch it right here, and be sure to tune in every Monday at 10am CST!